Wednesday storms spawned softball-sized hail in Georgia and damaging winds in upstate York, but no fatalities were reported, as of posting. 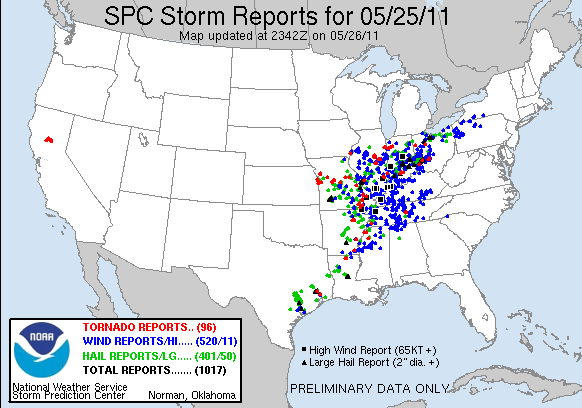 SPC received a total of 1,017 severe weather reports across 14 states on Wednesday (preliminary data) including 96 tornado reports. 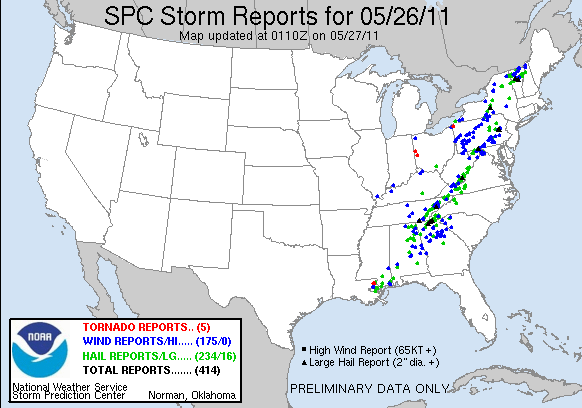 On Thursday there were 414 reports, including 5 tornadoes. Death toll from Joplin Tornado stands at 125, with about 1,000 injured. The number of missing since the tornado struck 5 days ago is shrouded in secrecy. The figure previously released by the authorities, and subsequently retracted, was 1,500. The actual figure for those unaccounted for may be closer to 1,000. Death toll from tornadoes swept the Midwest on Tuesday night, has climbed to at least 16 people: 10 fatalities in Oklahoma, 4 in Arkansas and 2 in Kansas. 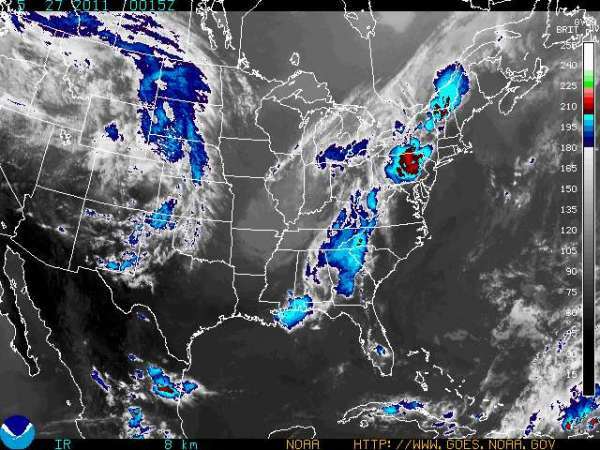 Locally damaging thunderstorms were firing from the central Gulf Coast to northern New England and were part of the same system that terrorized the Plains earlier this week. The storms were avoiding the I-95 corridor this evening, but were taking few prisoners over the Appalachians, westward to Ohio, southern Ontario and part of southern Quebec. Large hail and damaging straight-line wind gusts will be the most common outcome from the strongest thunderstorms. However, a few tornadoes are possible, especially from the Virginias northward to northwestern New England. There are reports of a possible tornado touchdown in Crawford County, Pa. with numerous trees down. Many areas in the Appalachians will be hit or threatened by the storms at some point this evening. Later tonight through Friday the primary threat will that of flash, urban and small stream flooding.